The mutant lacks expression of Schizont Membrane Associated Cytoadherence protein (SMAC). The mutant does not contain a drug selectable marker which has been removed by the negative selection procedure using the negative selectable marker yfcu (yeast cytosine deaminase and uridyl-phosphoribosyltransferase) and the drug 5-fluorocytosine (5-FC)( (Braks et al., 2006, Nucleic Acids Res 34, e39). Phenotype analyses indicate that that the reduced growth rate of blood stages in mice is not the result of a prolonged cell cycle (schizogony) or a reduced number of merozoites produced per schizont. Evidence is provided that parasites lacking SMAC-expression have a reduced capacity to adhere to the host receptor CD36 resulting in a strongly reduced CD36-mediated sequestration phenotype. The non-sequestering parasites have a reduced growth and evidence is provided that in addition to avoiding spleen removal other factors related to CD36-mediated sequestration are beneficial for parasite growth. The mutant parasites cause cerebral complications in C57Bl/6 mice (with around one day delay)(unpublished observations). Analyses of a mutant expressing a mCherry-tagged version of SMAC (SMAC::mCherry; RMgm-663) showed export of SMAC into the cytoplasm of the host erythrocyte. Staining of live SMAC::mCherry and wild type infected erythrocytes with anti-mCherry or anti-SMAC antibodies did not provide evidence for exposure of SMAC on the surface of infected erythrocytes. Gene product: Alternative name Schizont Membrane Associated Cytoadherence protein; SMAC. Additional remarks genetic modification Two general gene targeting DNA constructs pL0001 or pL0037 were used to generate constructs to disrupt the genes selected from the proteome analyses. These constructs are aimed at targeted gene disruption by double cross-over homologous recombination. 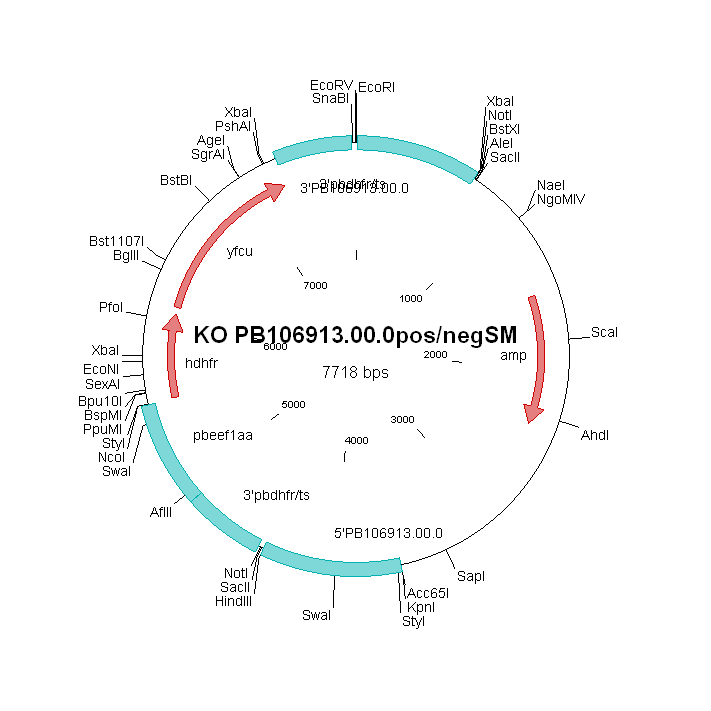 Sequences of the open reading frame (ORF) and UTR regions of the selected genes were retrieved from PlasmoDB and GeneDB (www.plasmodb.org; www.genedb.org). To replace the ORF of the target genes with the selection cassette containing the pyrimethamine-resistant dhfr/ts of Toxoplasma gondii, the 5′ and 3′ flanking regions of the ORF were cloned up- and down-stream of the selection cassette of pL0001 or pL0037. Additional remarks selection procedure The mutant does not contain a drug selectable marker which has been removed by the negative selection procedure using the negative selectable marker yfcu (yeast cytosine deaminase and uridyl-phosphoribosyltransferase) and the drug 5-fluorocytosine (5-FC)( (Braks et al., 2006, Nucleic Acids Res 34, e39).